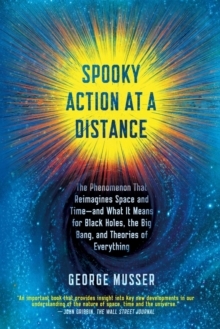 Yet over the past few decades, physicists have discovered a phenomenon that operates outside the confines of space and time: nonlocality - the ability of two particles to act in harmony no matter how far apart they may be. If space isn't what we thought it was, then what is it? In Spooky Action at a Distance, the award-winning journalist George Musser sets out to answer that question. He guides us on an epic journey into the lives of experimental physicists observing particles acting in tandem, astronomers finding galaxies that look statistically identical, and cosmologists hoping to unravel the paradoxes surrounding the big bang. He traces the contentious debates over nonlocality through major discoveries and disruptions of the twentieth century and shows how scientists faced with the same undisputed experimental evidence develop wildly different explanations for that evidence. Their conclusions challenge our understanding of the origins of the universe - and they suggest a new grand unified theory of physics.